We are delighted to stock the excellent The Big Acoustic Guitar Chord Songbook: Platinum Edition. With so many available these days, it is good to have a brand you can trust. The The Big Acoustic Guitar Chord Songbook: Platinum Edition is certainly that and will be a perfect acquisition. 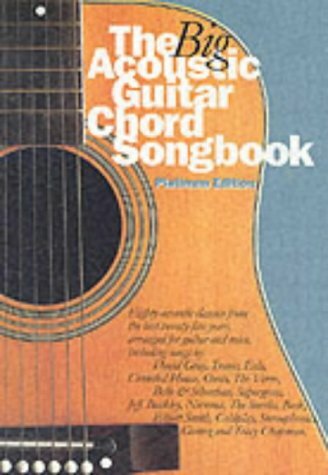 For this great price, the The Big Acoustic Guitar Chord Songbook: Platinum Edition is highly recommended and is a regular choice for lots of people. Music Sales Ltd have provided some great touches and this means great value. Arranged for guitar and voice, this songbook contains acoustic classics from the late 20th century, including songs by David Gray, Travis, Eels, Crowded House, Oasis, The Verve, Belle and Sebastian, Supergrass, Nirvana, The Smiths, Coldplay, Gomez, Stereophonics and Tracy Chapman.